If your course has enabled Google Apps, you can view all files in your Google Drive account in Canvas. 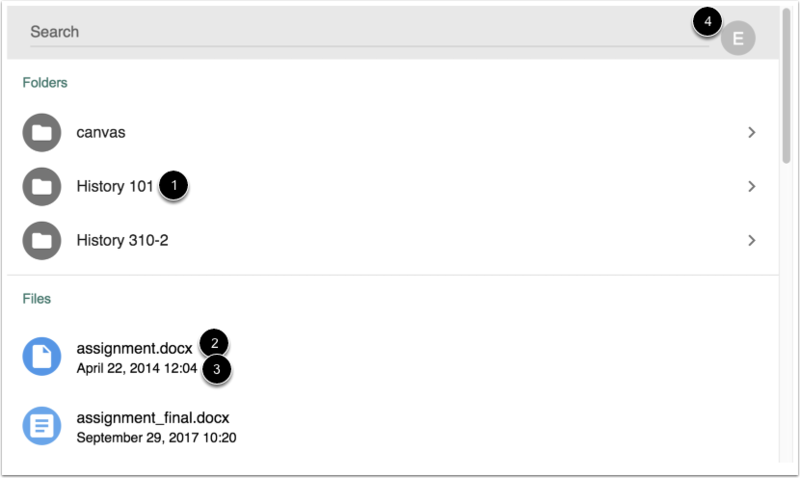 The Google Drive folder is accessed from the Course Navigation Menu. You can only view one Google Drive account at a time in Canvas. Make sure you are logged in to the account you want to view in Canvas. If necessary you can log out of your account and authenticate with a different account. If you are already logged into a Google account in Chrome, Canvas will use that Google account to authorize Google Drive access. If you want to authenticate using a different Google Drive account, you must log out of the Google account in Chrome and sign in to the account you want to use with Canvas. If your Canvas authorization has failed, try logging in to Google Drive in Canvas using an incognito browser, which removes all browser cookies and extensions. If you are able to log in with the incognito browser, you are most likely logged in to Google Drive and/or Canvas with different Google accounts. Confirm the account you are using for each location and try again. You may also need to confirm any Google extensions installed in your browser's settings. The location where you access your Google account may affect your access to Canvas. If you successfully authenticate with your account at your institution, you may have to reauthenticate when you log in to Canvas at home. Currently, Google Drive files cannot be accessed from course or personal files in Canvas. They can only be accessed from the Google Drive link in Course Navigation. 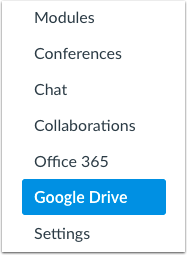 In Course Navigation, click the Google Drive link. You may be asked to authenticate your account. Click the Authorize button. 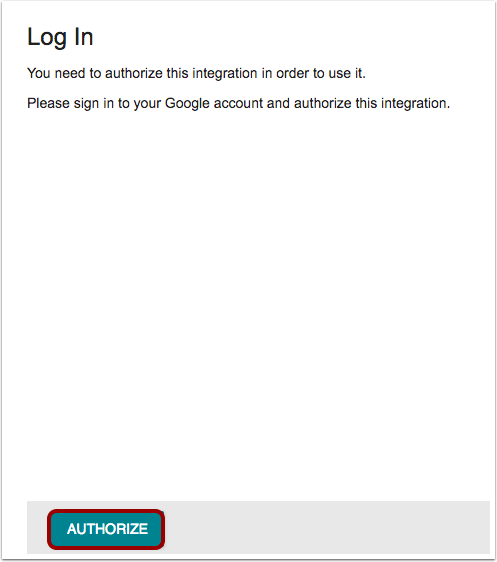 In an external window, enter your Google App email and password. Note: If you are unable to authenticate, please see the troubleshooting information in the description of this lesson. View the files and folders in your Google Drive folder. Google Drive displays the name of each folder . You can view the contents of each folder by clicking the folder name. 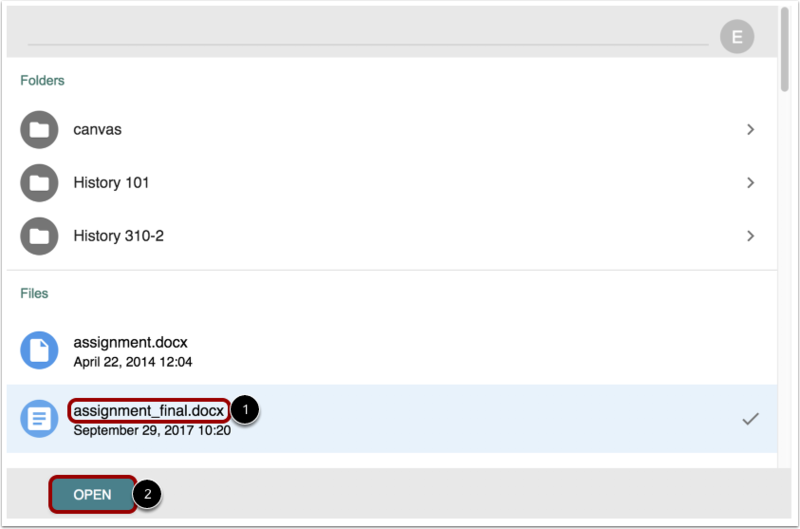 For individual files, you can view the file name  and the date it was modified . To view the linked Google Drive email or to sign out of your Google account, click the Account button . To search for a file, enter the name of the file and click the Enter (Return) key on your keyboard. Google Drive returns file results related to your search. To open a file, click the name of the file . At the bottom of the window, click the Open button . In a new browser window, view the file in your Google account. Previous Topic:What types of media files can I upload in Canvas as a student? Next Topic:How do I view my Microsoft Office 365 files in Canvas as a student? Table of Contents > Files > How do I view my Google Drive files in Canvas as a student?